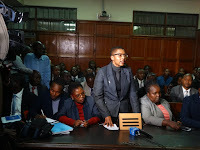 Wednesday August 29, 2018 - The Director of Public Prosecutions, Nordin Haji has said that the arrest and prosecution of Deputy Chief Justice Philomena Mwilu should not be treated as an attack on the Judiciary. On Tuesday, Mwilu was arrested and taken to court over corruption related offences. Many Kenyans, especially ODM supporters, said Mwilu’s arrest is an attack on the Judiciary. But making his submission before Anti Corruption Magistrate, Lawrence Mugambi, on Wednesday Deputy Prosecutor, Dorcas Oduor, said Mwilu is being charged as an individual and this is not a trial of the entire Judiciary. She further said the DPP has the mandate to institute criminal charges against anyone and by taking Mwilu to court, she acted in the interest of the public. Oduor made the remark after ODM Secretary General, Edwin Sifuna, claimed that Mwilu’s arrest was a political witch hunt.